our advent gift for today is this interview with Iker published by FIFA today, where he looks back on his (and our) unforgettable South African experience. Q: Iker, the FIFA Ballon d’Or 2010 will be awarded shortly. Who’s your favorite to win it? A: I think it’s only fair that it should go to a Spanish player. They’ve been in vogue for the last two years now. World Cup performances always go a long way to deciding it and if a Spanish player doesn’t get it this year, then I just don’t know. Q: Your name was on the short list but no goalkeeper has ever won the award. Why do you think that is? A: An outfield player is always more likely to win awards than a goalkeeper, and I understand that in football it’s moves, passes, goals and interplay that counts. I don’t know, maybe we’re the black sheep of football (laughs). We’re the odd ones out. 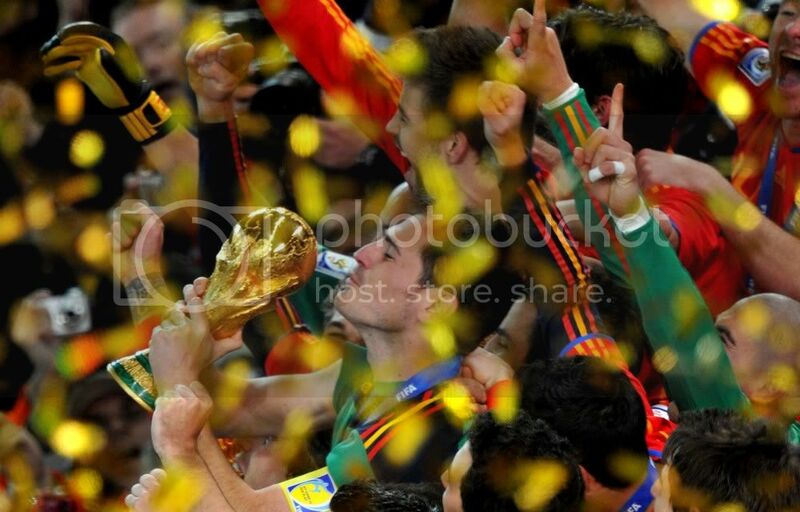 Q: In winning the 2010 FIFA World Cup South Africa, Spain conceded fewer goals than anyone. You’d be a deserving winner. A: Well, we all played our part, the men at the back too. It’s very important you stay solid and stop the opposition creating chances. Q: Spain’s midfielders and forwards have received a lot of praise but the defenders have just as much quality. A: They’ve got a lot of talent and they’re also a mix of younger and older players who combine really well. I think the important thing is that they all help each other. A: Yes, and mainly because he missed that penalty in the match against Honduras. He’s a great player, though. He scored five goals in all, some very important goals too, and made a big contribution for Spain. El Guaje did a great job for La Roja and we have a lot to thank him for. Q: You’ve hardly stopped since the 2007/08 season. As well as playing for Real Madrid in every competition, you’ve also had UEFA EURO 2008, the FIFA Confederations Cup and the FIFA World Cup. Don’t you feel tired? A: It’s definitely tough to keep going because I’ve only had very short holidays in the last three years. But as long as you get 15 to 20 days off, you can give your mind a break and then you’re ready to get back out there. This is a great job to do and sometimes you get privileges and sometimes you have to make sacrifices, for want of a better word. Next year should be a bit calmer hopefully. Q: In what way has being a European and world champion made your life different? A: It changes you because people know you wherever you go and come up and say nice things to you in the street. I’m so pleased to have made millions of people happy with these historic achievements. Q: It must be an amazing feeling to be captain of the Spain team. A: Yes, it is. It’s a pleasure to skipper this side because we’ve got some great players and because I’ve been lucky enough to play a part in this glorious chapter. It wasn’t so great before (laughs). We had one disappointment after another and really suffered. Sometimes things change – and they’ve changed for us now. Q: What are your most vivid memories of South Africa 2010? A: Being together as a team, the atmosphere and the bad times we went through after losing to Switzerland. Everyone said we were favorites to win and we took a lot of criticism. But we kept quiet, stayed focused and slowly started making our way. There are a lot of trophies to win in the world of football but none of them like this one. Q: Were you disappointed by the way the Netherlands played in the Final? A: No, not at all. The Netherlands had a fantastic tournament and they played great football. The thing is, they came up against a Spain team that really knew how to control possession and they had to try to stop that some way. That was their way of going about it, but it didn’t work out for them. Q: Aside from Spain’s success, what else stands out for you from the World Cup? A: Germany. I think they’re a very strong side and they’ve got some good young players. They came into the tournament strong and played so well against tough teams like England and Argentina. They’re going to have a lot of success in a couple of years. Q: And who disappointed you in South Africa? A: France, because of the way they went out, and Italy for getting knocked out in the group phase. The fact that the two finalists from 2006 went home so early just goes to show how quickly things can change in football. And it can happen to anyone too. Q: You’ve won everything now with the national team and your club. What challenges do you still have to meet? A: I want to keep on winning everything. Our first objective now is to go and retain our European title. Q: Finally, what’s the worst thing about being a professional footballer? A: I don’t think there’s anything unpleasant about it; maybe the fact that the people close to you suffer whenever you come in for criticism [just go ahead and say Sara, Iker, we all know who you're referring to]. It might not affect you, but it can be hurtful for the people you love. Iker’s also asked about Real Madrid, so click on the link if you want to read that part!